All in one entry level Weighing & EID System. With the integrated EID reader, now you can go hands-free. The TWR -1 is completely automated to enable the task of reading and weighing to be done by one person. Integrated EID Reader -Completely automated to enable the task of reading and weighing to be done by one person. 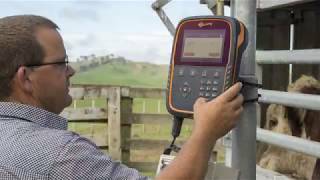 Removes the need to charge, transport and setup a second piece of equipment when managing livestock. Capture weights and EIDs or alternatively use the TWR -1 to capture only EIDs. Draft by Weight Gain -Allows you to quickly identify and separate animals not meeting target growth rates. 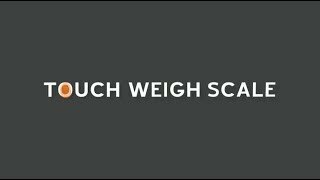 Complementing the ability to draft into weight classes, the ability to sort based on weight gain is a powerful feature of the TWR -1. Intuitive Touch Screen -Navigate through expensive electronic devices using touch technology. Bright, Daylight readable colour LCD -Market leading visibility in all conditions. The toughened glass face is scratch resistant and easy to keep clean. The large 7" display provides ample room to display the most important information in an easily readable size. Simple User Interface -The dynamic collect screen layout adjusts to fit selected information in a large and easy to read format. Animal notes and Note alerts -Record notes against animals on the spot for later review. Note alerts pop-up and halt any action until acknowledged - which eliminates errors when dealing with critical actions or warnings. Flexible Connectivity Options -Whether connecting to drafters or readers via a serial cable, to a PC via USB or Utilising the Bluetooth and Wi-Fi wireless options, the TWR-1 has every option available. Flexible Mounting Options -Able to be comfortably used sitting flat on a drum or mounted to a vertical surface via the bracket. The adjustable mounting bracket allows you to easily tailor the viewing angle for optimum visibility. 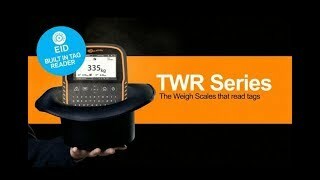 Graphs and Statistical Analysis on Device -The TWR-1 can show individual weigh gain graphs, as well as weigh distribution plots for a weighing session. At a glance it is easy to see if animals on target. Animal information can also be analysed by draft group to analyse vital statistics such as pregnancy rate. On-Board Help -The entire product manual is baked into the product. No matter where you are, or what you are trying to do on the product help is only a touch away. Simple Calibration Process -The TWR- 1 series will automatically interface with Gallagher's 2000kg, 3500kg and 4500kg loadbars, the 5000kg heavy duty weigh feet, as well as 250kg and 500kg hang calls. Most other load bar brands can be used with the TW scales, with a simple calibration wizard allowing them to store the custom set up. Different weighing sites can be named, so that the scale calibration is easily selected for each location independent of load bar brand used.